/ Idea Prepaid Recharge With 1 Year Validity? 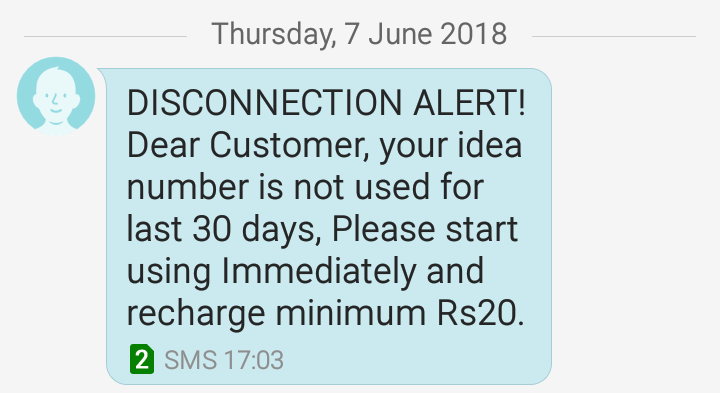 Idea prepaid recharge with 1 year validity? For my Idea prepaid number (Maharashtra circle), I would like to switch to a plan with least cost. I only need to use that number for receiving SMS/ OTPs from banks etc. At the same time, I do not wish to remember to recharge it every now-and-then. Is there some way to do that? Idea website shows me an unlimited validity full talk time plan of Rs. 120. Does that mean, if I just pay Rs. 120, I don’t need to worry about recharging again, every year? even 10rs recharge will give u unlimited validity, what u want? unlimited validity doesn’t exist…you need to send sms/make a call atleast once in 90 days.